Long term projects like new homes have their pacing -- certain parts of the project appear to go quickly, certain parts seem to take longer. External forces like permits, inspections, and the weather can each have their own role in slowing or speeding a job up. As the project draws to a close, time seems to hit fast forward. There's never enough time, seemingly, but so much is being accomplished each day! At the end of BAC's ground up project, progress is being made daily with many different trades working simultaneously to get all of the finishing touches for the Kitchens done -- all those touches you can't live without like appliances, counter tops, floors, and faucets. Ben and Stephanie are excited to be nearing the end of this project and moving soon. The whole BAC team has been involved at times in bringing the Kitchen's new house from the page to reality. Benjamin Andrew Construction will also have new headquarters in the detached garage. Enjoy this sneak peek of some of the finishes. Cristian is cutting tile for the bathrooms. This book nook in one of the bedrooms is a great use of space -- way to use a dormer window to make a statement piece. The perfect place to snuggle up with a book! Brad & Hannah, our carpenters, working on the porch roof. What a peaceful view! 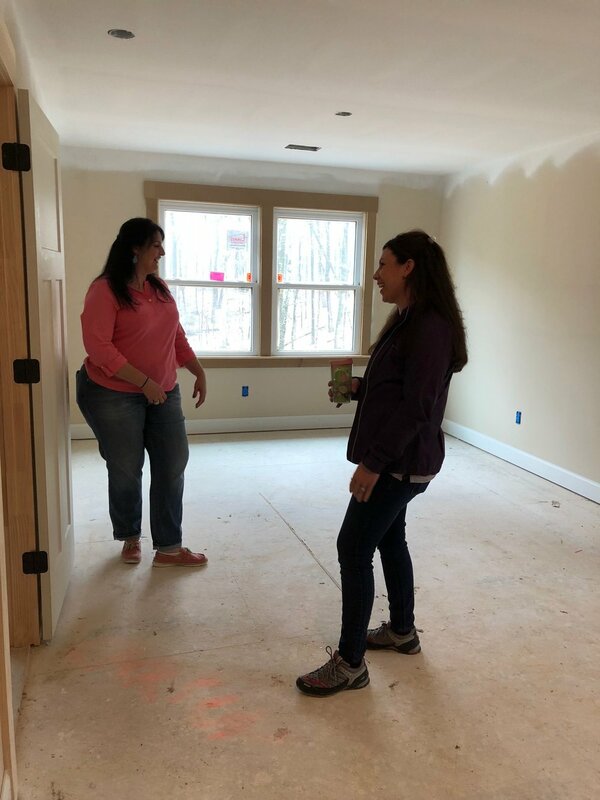 Steph getting some help conceptualizing the room layouts & interior paint colors from Kristin Harrison. Project Manager Ian and John, BAC carpenter, at work installing trim. Notice the thin-brick flooring! This area is the mudroom and will see a lot of heavy traffic. Finishing up the hardwoods. The custom finish was tricky to decide on; can't wait to reveal the final look soon. The kitchen cabinets are in, waiting finishing touches like pulls & glass panels. Here, the granite company is creating the template for the expansive kitchen island. Final coat of paint going on the light and airy walls in the living room. Catch a glimpse of the fireplace in the corner? And finally, the detached garage received it's permit from Forsyth County and was started. The BAC office is off to the right there, with its own entry. Hope you enjoyed a walk through the flurry of the last few days and the last finishing touches on the Kitchen home. Interested in a new custom home that brings your dreams out of your head and into reality? Let's start talking!